Garrison Keillor, a fixture of public radio and the creator of "A Prairie Home Companion," has been fired because of allegations of misconduct. Minnesota Public Radio said it was terminating its contracts with Keillor and his private media companies, citing "allegations of his inappropriate behavior with an individual who worked with him." It did not elaborate on the nature of the allegations. "I've been fired over a story that I think is more interesting and more complicated than the version MPR heard," Keillor said in a statement posted to his website. "It's some sort of poetic irony to be knocked off the air by a story, having told so many of them myself, but I'm 75 and don't have any interest in arguing about this." "I cannot in conscience bring danger to a great organization I've worked hard for since 1969. I am sorry for all the poets whose work I won't be reading on the radio and sorry for the people who will lose work on account of this. But my profound feeling is that of gratitude, especially to my wife Jenny, and for this painful experience that has brought us even closer together." Keillor added that he is "deeply grateful," for his years working on "A Prairie Home Companion," and other productions. MPR, which produces "A Prairie Home Companion," said it was notified of the allegations last month, and that they related to his conduct while he was responsible for production of the show. Keillor, 75, created the folksy variety program in 1974 and hosted it for decades until he retired last year. MPR said it will stop rebroadcasting episodes of "A Prairie Home Companion" from the Keillor era. It also said it will change the name of the show, which is now hosted by Chris Thile. 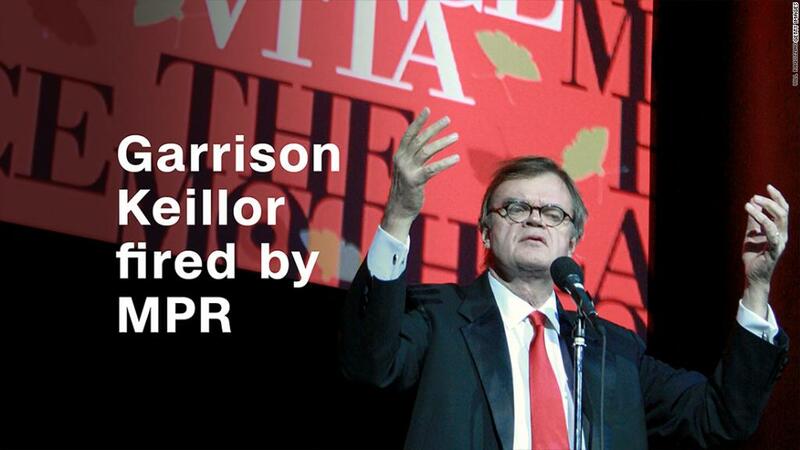 "Garrison Keillor has been an important part of the growth and success of MPR, and all of us in the MPR community are saddened by these circumstances," said MPR president Jon McTaggart. The radio network said that it retained an outside law firm to conduct an investigation. Keillor, in an op-ed for The Washington Post published on Tuesday, had defended Minnesota Democratic Senator Al Franken, who was recently accused by Leeann Tweeden of groping and kissing her without her consent during a USO tour in 2006. Keillor wrote that calls for Franken to resign were "pure absurdity." Speaking to the National Press Club in 1994 about his work on "A Prairie Home Companion," Keillor made an aside about sexual harassment. "We should be careful though not to make the world so fine and good that you and I can't enjoy living in it," he said. "A world in which there is no sexual harassment at all is a world in which there will not be any flirtation."